15 grams of live, reusable milk kefir grains - Make your own Milk Kefir at Home. Make milk kefir at home. 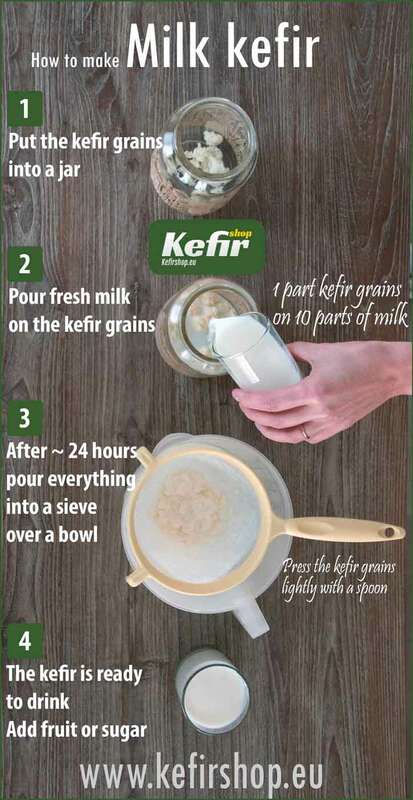 Making kefir is easy ! Details : Milk kefir grains are living cultures (composition = yeast and bacteria). After the addition of milk to the kefir grains and a fermentation of approximately 24 hours, you have a delicious probiotic beverage. Milk kefir can be consumed or flavored with sugar, fresh fruit. 1 sachet of live kefir grains contains : Fresh and reusable kefir grains for the production of milk kefir. This product does not contain genetically modified ingredients. Packaging : Packed in food safe packaging. Features : Milk kefir grains for making kefir. Milk kefir contains dairy (lactose), when mixed with milk of animal origin.